When you put Icynene spray foam insulation anywhere in your home, the general benefits of insulation combined with an air barrier apply, but there are also additional reasons to use it in very specific parts of a home. 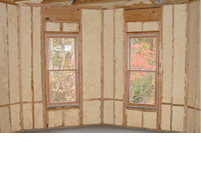 Below are just some of the areas of concern Icynene spray foam insulation can address for your clients. Up to 40% of energy loss is due to uncontrolled air leakage. Up to 99% of moisture travels in the air and can build up inside a home through daily activities like cooking and showering. If moisture carried by air is allowed to move through the walls it can condense within the walls leading to related problems such as mould. Unwanted noises are heard originating from plumbing runs or from the adjoining media room. 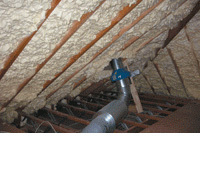 Duct leakage remains within the conditioned space, eliminating the loss of conditioned air. HVAC equipment stays cooler inside the seal created by Icynene foam spray insulation and works more efficiently for superior cooling performance, locking in energy savings. Source of a roof leak is easily detectable for repair and the material is unaffected by the wetting/drying process, maintaining original performance once dried. Sealing soffit vents with Icynene foam spray insulation controls rain water and wind-driven moisture ingress for added durability. 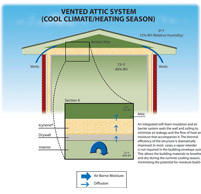 Stack effect occurs when heated air escapes through the ceiling into the attic from upper levels of the home and is replaced in lower levels of the home by drawn-in, outdoor air. This occurs with conventional insulation types, such as fiberglass and cellulose, because they don’t meet air barrier standards (based on air permeability testing, ASTM E 283). Therefore they don’t sufficiently stop air flow/leaks like Icynene foam spray insulation does, and they can sag or settle over time. In heavy snowfall areas, ice damming is a common problem due to warm, moist interior air coming into contact with the cold roof surface, where the moisture then condenses and freezes. The bonus room over the garage or porch is often uncomfortable. In cold climates, for example, floors can be 10° F cooler than the room. This is because, in the ceiling of the garage, insulation does not stay in contact with the floor above as Icynene foam spray insulation would. Due to voids/air spaces in fibrous insulation, the floor in the bonus room is colder than the rest of the home. 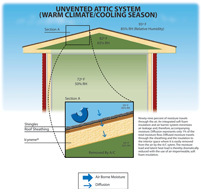 Without extra sealing material, conventional insulation can allow exterior air, exhaust fumes and odors to penetrate from the garage or exterior into the living space above. 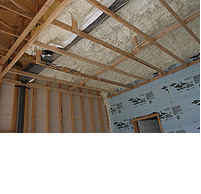 The tenacious adhesive characteristics of Icynene foam spray insulation allow for a seamless bond with the substrate, free from sagging or voids of any kind. This means an evenly heated/cooled floor and interior space for optimal comfort. By protecting the adjoining living space against fumes originating from the garage below, the Icynene foam spray insulation creates a healthier indoor environment. 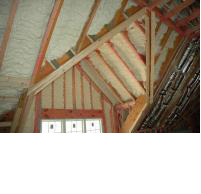 Designs or architectural features can pose insulation challenges because conventional insulation doesn’t fit unusual cavities like Icynene foam spray insulation does. Batting is standard-sized and must be cut, manipulated or compressed to fill unusual spaces (like electrical boxes), reducing their rated U value and sometimes requiring extra finishing materials. Steel framing consists of ”U” and ”C” sections, double studs and non-standard stud locations that make insulating a challenge.